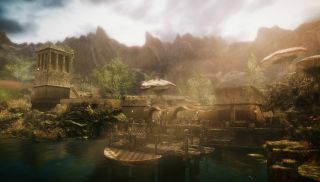 After last month's "Call to East" trailer , I doubt anyone would have dismissed Skywind's aim to port Morrowind into the Skyrim engine as an easy task. Now, though, the Skyrim mod's first official development diary will give you an idea of the epic scope of the project, and the ambition and dedication of its 70+ team of volunteers. And all so you don't have to go back to the third Elder Scroll's angular and low-poly giant mushrooms. The diary reveals some of the difficulties of crowbarring that windiest of Morrows into the Skyrim box. For one thing, the elder game's technical limitations mean that landscapes are unusually barren. As a result, the team have had to fill in the gaps - increasing the detail of the world in order to make it feel more alive. For all the effort involved, it should lead to a better mod overall. I'm always a little suspicious of straight engine remakes, especially when older PC games can usually be modded into a much improved state on their own terms. But a complete re-imagining, with the team's own personality stamped into the final release, will hopefully mean a mod that can both please Morrowind's fanbase, and also provide a fresh experience. The developers of Skywind are currently looking to bolster their already sizeable ranks of volunteers. To get involved, or to just find more information on the project, head over to the official development forum .